Our first breakfast on board we enjoyed on the back deck of the ship. It surely pays to go early, since by the time we left the buffet area at 7:30, people were having a hard time finding a place to sit. We got close to the meeting place for our excursion when I realized that I had forgotten the tickets! So Jeannie had to run back to our stateroom, which of course was at the opposite end of the ship, but she made it back on time for us to board the bus with Kathy & Randy. Our first stop was a Limoncello factory, which offered free samples (Yay!) and free facilities (Yay!). 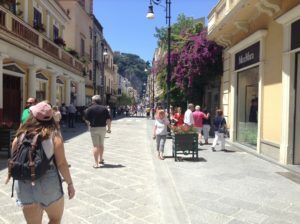 From there we were dropped off in Sorrento, a quaint little tourist town, for 2 hours of wandering, shopping and eating. We had to rush through lunch and skip dessert to get back to the meeting point in time, only to find that the bus was late! Well, anyway, we drove from there to the famous ruins of Pompeii, where we got a guided tour of the ruins by our guide, who claimed to be a part-time tour guide and full time archaeologist. The place was Huge! Much bigger than I expected. The tour itself was informative, if long, but it was wicked hot. They gave us each a radio receiver and the tour guide had a transmitter, so we could all hear him, even if we couldn’t understand all of what he said due to his rather thick accent. Nevertheless, this did eliminate one of the problems with guided tours I mentioned in a previous post. It didn’t eliminate the in-one-ear-out-the-other problem. Back on the ship, we had a relaxing evening; didn’t do much but walk around the ship and retire early.